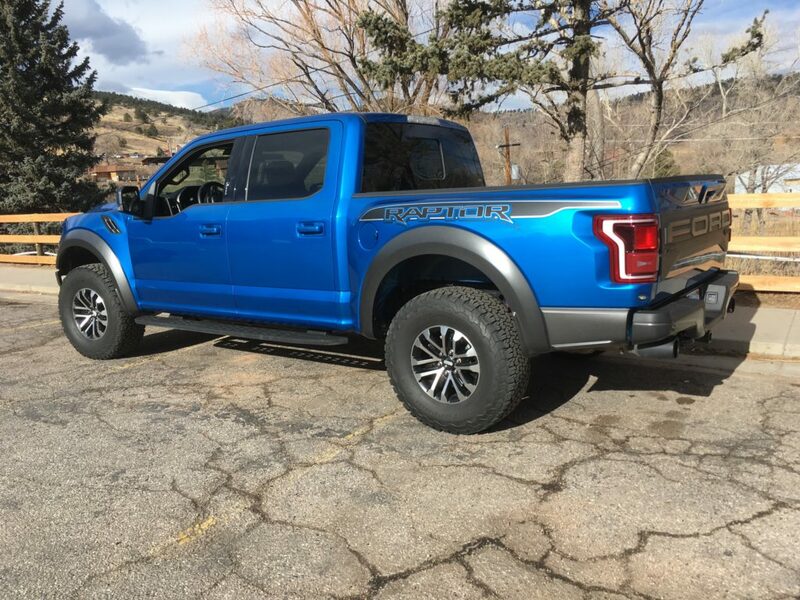 Even with its oversized presence and accompanying parking concerns on occasion, I looked forward every morning for a week, walking out and climbing up into the high-riding 2019 Ford F-150 Raptor 4-by-4, and driving, and driving. The Raptor was at its best whether the drives were short runs about town, or to the west into the beautiful Big Thompson Canyon, or, especially, during a bit of offroading. The performance of Ford’s EcoBoost High Output V-6 engine is outstanding; there’s no longing from me for a V-8. Tied to a 10-speed automatic transmission with paddle shifters, the second-generation EcoBoost is of twin-turbocharging and reaches 450 horsepower and 510 lb.ft.of torque. It is strong and fairly effortless, with excellent sound from its dual exhaust. The Supercrew’s big-tread tires, Goodyear All-Terrain LT315/70R17s, are for roughing it offroad, yet the Raptor lends a smooth ride in and out of the city. Oddly, though, there is no apparent fuel-mileage gain with the smaller V-6 block. I averaged 15.4 miles per gallon in overall driving. 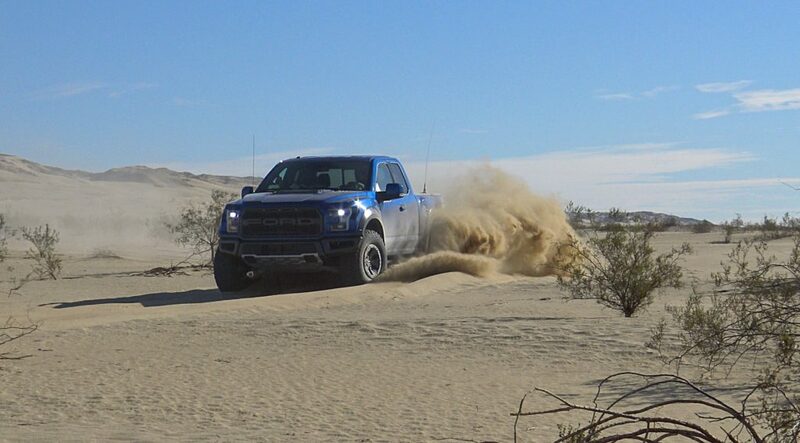 The Raptor easily maneuvered the bends of the Big Thompson Canyon roadway, while providing good ride comfort, as well. Ford’s ’19 version met the challenge of the curves with new Fox Live Valve internal bypass shocks that electronically adjust damping, using sensors in the suspension and body to maximize comfort, handing and bottom-out resistance. Three modes for the suspension are Normal, Off-Road and Sport, and the Raptor’s terrain modes include Normal, Sport, Weather, Mud/Sand, Baja and Rock Crawl, selected by pushing a button on the steering wheel. Paddles on the steering wheel help control all the downshifting and upshifting, and a 1-through-10 ladder on the instrument panel tells at a glance where the gear is set. The review model is finished in bright velocity blue color; the interior is highlighted by blue accent and Recaro seats. The 2019 F-150 Raptor is finished in velocity blue. Access is eased by 7-inch-wide running boards; adding pleasure once inside are a twin-panel moonroof, Bang & Olufsen sound, voice-activated navigation and heated seats front and rear. Heading a long list of other safety and performance amenities are adaptive cruise, automated emergency braking, blind-spot with trailer-tow monitoring, trailer-sway control, inflatable rear safety belts, rearview camera, electronic 4-by-4 shift-on-the-fly, pro-trailer backup system and terrain management. The high-pressure turbo and the many add-ons boosted sticker price for the new Raptor to $70,700 from a base of $57,335. Parking concerns on occasion come from the extra-wide Raptor body. With both front doors fully open, the Raptor is 10 inches wider from door-tip to door-tip than my four-door 4-by-4 pickup when opened likewise. Remote start is activated by pushing one of five buttons on the remote key fob. It and the button just beneath it are marked “2X,” indicating it must be pushed twice quickly for response. Push the wrong one and,instead of walking outdoors to a warming engine, the truck will be sitting there, cold as ever, with a dropped tailgate.